Chiefly east of the Cascades, British Columbia to Oregon, east to Montana. Dry, open areas from the plains to moderate elevations in the mountains. In Arizona it is found between 3,000-9,00ft. It is cold hardy, and tolerant of both moisture and salt stress. 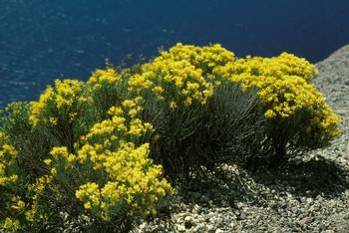 Chrysothamnus parryi (Parry rabbit-brush) is less shrubby, has larger leaves and smaller, paler flowers. Chrysothamnus viscidiflorus (Douglas rabbit-brush) and Chrysothamnus depressus (Dwarf rabbit-brush) are also similar to C. nauseosus and found west of the rockies. Pollen may cause allergic reaction. Best to collect in Autumn. Up to 3 year’s storage under ordinary warehouse storage conditions. Germination in rubber rabbit-brush is quite high, and seed viability remains relatively high (65 percent) for up to 3 year’s storage under ordinary warehouse storage conditions. Can plant as seeds or container grown. Seedlings sensitive to frost and drought. 6.6 to 7.5 (neutral), 7.6 to 7.8 (mildly alkaline), 7.9 to 8.5 (alkaline) and sandy soil. Grows on a wide range of soils. Soils tend to be medium to coarse-textured and somewhat basic, but may range from moderately acidic to strongly alkaline. This shrub commonly grows on dry, sandy, gravelly or heavy clay, and is somewhat salt tolerant. densities. Allow adequate space for rapid spread. Prefers full sun and well-drained, infertile soils. Fully cold-hardy. Drought hardy (i.e., needs no supplemental water after establishment on the Wasatch Front), and intolerant of overwatering. Spacing is 24-36 in. (60-90 cm). Grows up to seven feet in height, but is often much shorter, depending on the growing conditions. The nauseosus has branches which are permanently felted with white or greenish-white hairs. The leaves are usually three-fourths to two and three-fourths inches long. Plants may be full grown within 4 years.